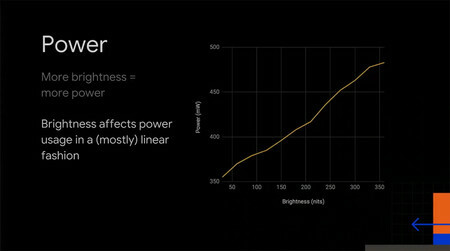 Google has confirmed during his event for developers Android Dev Summit what we already all knew, the level of brightness and the dark theme saves battery. 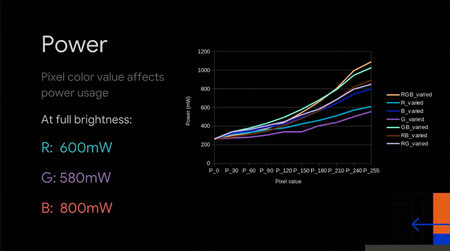 And what is done with statistics, comparing what it gets to save battery if the interface is black. The company has used a Pixel of the first generation to show how a interface black manages to increase the battery life thanks to its AMOLED screen in front of other interfaces of lighter colors, or against LCD screens. On the brightness level, it is clear that the more brightness the more battery consumption, but have discovered that is not always perfectly linear, there are small variations of growth, although it is practically a straight line. 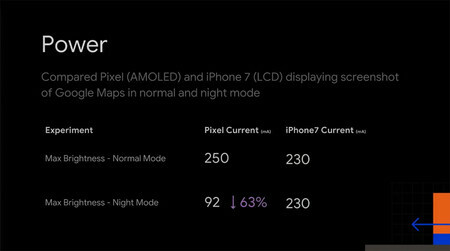 Facing a Pixel (AMOLED) compared to an iPhone 7 (LCD), using the navigation of Google Maps with your theme night and normal topic, found that in the Pixel battery consumption** down 63%** when the brightness was on maximum, and in the theme night. 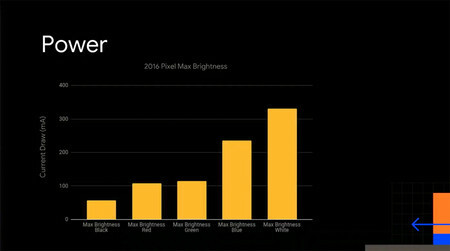 they Also discussed the color of each pixel of an AMOLED screen, showing that every color has a different amount of battery consumption. Logically the color that consumes less battery it is the black, which is the absence of these three colors, and the company is evidenced in the following statistics. White is the color that most drains our battery. 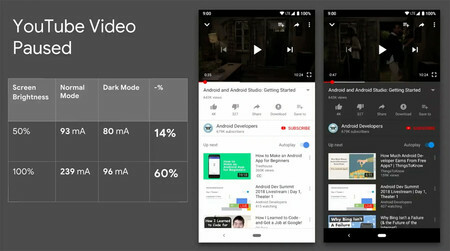 finally, Google shows in a comparison the use of the battery of the YouTube app being used with different levels of brightness and dark mode off and on. Using the dark mode with the brightness at 50% we achieved a 14% saving battery, having consumed 80 mA. In contrast, with the brightness at 100% in the dark mode achieves a 60% saving of battery, doing it consumed 96 mAh. The conclusions of this comparative is that saving of the battery of the dark mode is much more effective when the brightness is at maximum, getting to offer a consumption very close to if we had the screen with the brightness at 50%. 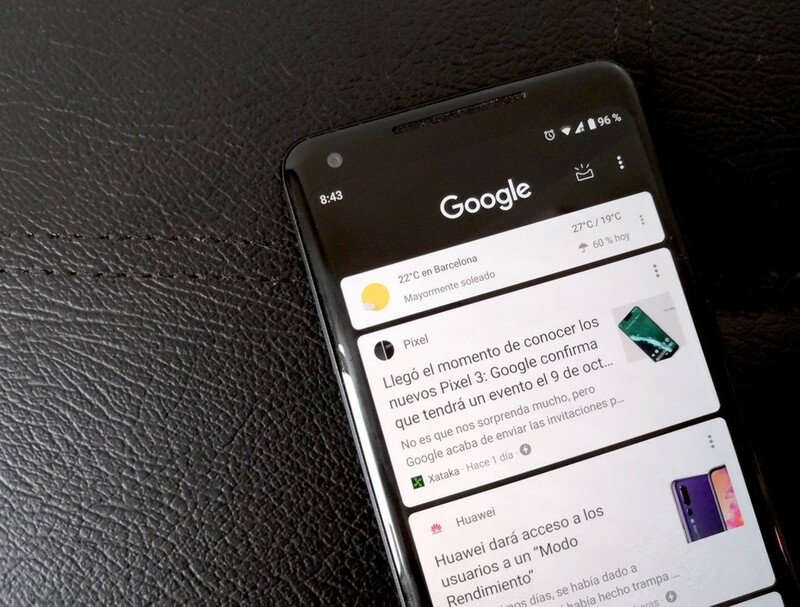 The news Google shows that the dark theme helps save battery on AMOLED screens was originally published in Xataka Android by Cosmos .